Bombardier has added a third Global 7000 business jet to its ongoing flight test programme. As part of the test, the Global 7000 flight test vehicle (FTV3) took off from Bombardier’s facility in Toronto, Canada, under the command of Captain Logan Lamping. A co-pilot and flight test engineers were also involved in the flight test programme, which began in November last year. Dubbed ‘The Navigator’, the FTV3 will be used by Bombardier to test the aircraft’s avionics and electrical system performance. “The Global 7000 business jet is a highly sophisticated, state-of-the-art aircraft." The FTV3 is the first production aircraft to feature a dual head-up display (HUD), which is designed to improve operational efficiency and safety in good or poor visibility, as well as reduce pilot workload. Bombardier Global 7000 and Global 8000 programme senior vice-president Michel Ouellette said: “The Global 7000 business jet is a highly sophisticated, state-of-the-art aircraft. With the ability to fly 13,705km at 0.85mach speed, Bombardier’s Global 7000 jet can carry eight passengers in a non-stop flight from London, UK, to Singapore under certain conditions. The aircraft is expected to enter service by the second half of next year. 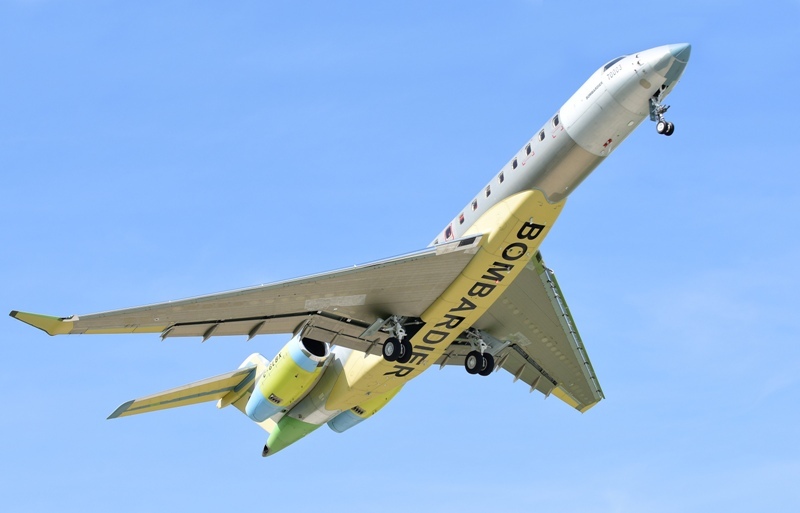 Image: Bombardier's third Global 7000 flight test vehicle makes its first flight. Photo: courtesy of Bombardier.